When I was a child, I’d sneak a flashlight into bed and read under the covers. Somehow my mother always knew what I was up to; but before she did, I had many an adventure. I’ve always loved to read. I worry that today people are so plugged into their smart phones, games, and movies that they miss out on the thrill of imagination and the deep emotional connection only a good book can bring. Of course, people once said that eventually libraries would be obsolete and that children would forget how to read. Then along came Kindle, and now probably more people read than ever before because they have a lightweight device they can slip into a backpack or purse, take to the beach, or read on a plane. And what of the libraries? They adapted. Libraries today are centered on the new technology to make research and information gathering even better. They’ve transferred the old video movies onto DVDs or online experiences. And fortunately, the patrons are there in throngs. The regional library I go to is always busy from morning until night. The library also sponsors early voting and other community events from art shows to guest speakers continuing their reputation as the prime learning and information center in the area. Books can take us out of our comfort zone. They may jar us, rattle our cage, and challenge our perceptions. Books may actually change us. Good literature can enlarge our souls and make us better people. In the same vein, negative or poorly written books not only waste our time, but may make us less than what we can be because they appeal to our baser nature. 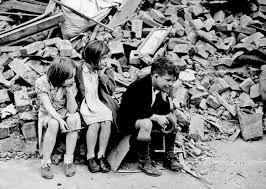 “Victims of war” — Innocent children. I just finished reading a beautifully written book on my Kindle called “All the Light we cannot See” by Anthony Doerr. It falls into my favorite genre, historical fiction; but it is far different from any war story I have ever read. The exquisite character revelations and subtleties are sublime. I could hardly put the book down and I hated coming to end. I became so close to the lead characters that I laughed and cried with them. I felt their fear and their pain. 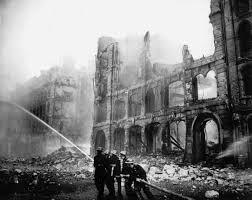 In my lifetime, World War II slashed an ugly gash across the world, although, I was too young to remember it. My father worked at the shipyards in Bremerton, Washington, repairing ships that had been damaged. He was a welder. He was a giant. I rode astride his shoulders and felt that he could conquer the earth. My mother washed our bedding and clothes in the bath tub by hand because they couldn’t afford a wash machine. She hung our clothes on a wooden rack in our living room around a hot oil stove. After a bath, my older sister and I would crowd around the stove in the middle of winter to warm ourselves. More than once, I dropped my towel and burned my bottom bending over to pick it up. A fox hole and a gun, his only protection. We shopped in a warehouse that had sawdust on its floors. We used our ration book to decide what we could buy and then tried to make our purchases last through the month. 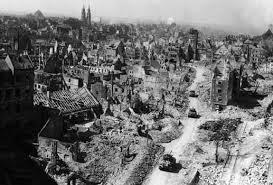 Remembering how it was and what we experienced could still not compare to the people and countries that were occupied during World War II. You think you know what poverty is try boiling potato peelings in a pot without meat and squeezing the last bit of nutrition from them as your meal for the day. And when fresh water is not available, try drinking from the saved water in your bath tub or a few pails set aside for that purpose. 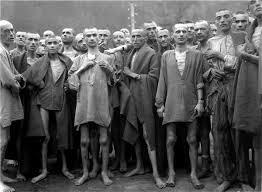 Survivors of German Prison Camps after World War II ended. When a sweet orange or a loaf of bread comes your way, you are filled with tears of gratitude. Most of us never experience real hunger. There is always someone somewhere who will provide for our needs. Not so during war when imprisonment, danger and scarcity makes it almost impossible to conduct business or to plant or harvest. 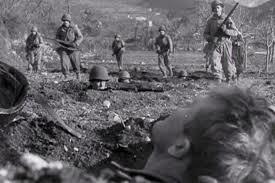 Even in war times we have a choice to act with integrity and gratitude. There are always those who use the chaos to their advantage. They take from those who have and they hurt the weak and vulnerable. May that never be said of you. If your character and who you are sink to the lowest levels of human behavior, then the real war has already been lost.